Around 1200 the Khmer King Jayavarman piled more stones on the earth than any other Khmer king had by a huge margin. Many folks focus on the big monuments, like Preah Khan, Ta Prohm and the Bayon. But some of his smaller temples are just as rewarding. I found Neak Pean as moving as the behemoths. Neak Pean consists of 5 square ponds–one in the center, and one adjoining each of its sides. The central pond is in the above photo. There used to be 8 other ponds surrounding the middle 5. Several scholars think that the central pond might have represented a mythical Himalayan lake that was imagined as the source of India’s 4 greatest rivers, and renowned for miraculous healing. Each of Neak Pean’s 4 side ponds was connected to the main water by an elegant little chapel (one is shown above, from the side). 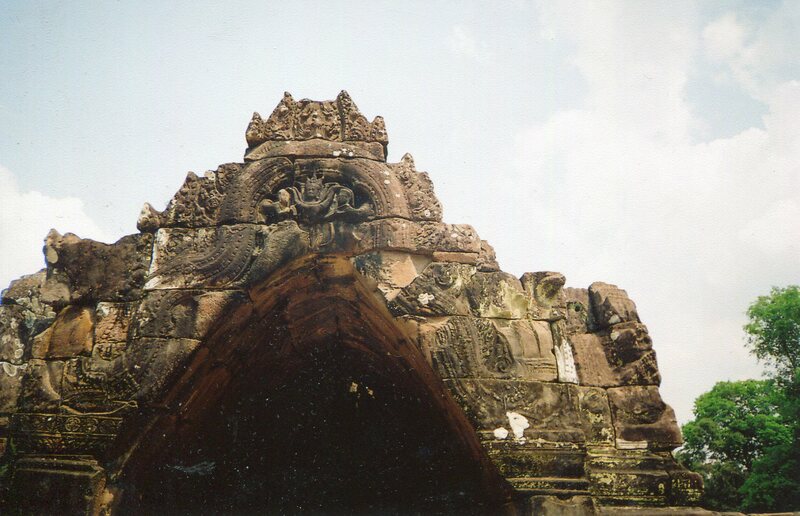 The upper part of a chapel’s entrance is in the above shot. People might have come to Neak Pean for physical therapy. Perhaps the water’s medicinal powers flowed to patients in these places, relieving aching muscles and fevers. 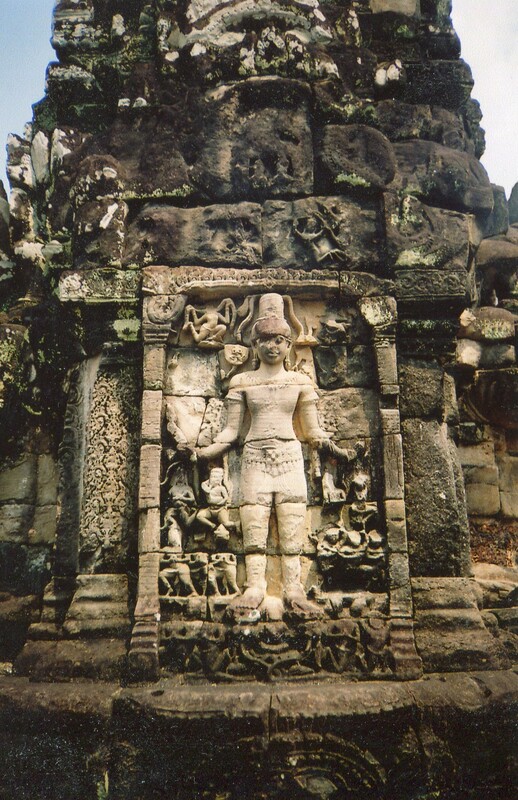 Neak Pean’s shrine in the middle of the central lake has a statue of Lokesvara on 3 sides (above), a compassionate deity in the Mahayana Buddhist faith which Jayavarman embraced. You can see the shrine from the distance in the first photo. 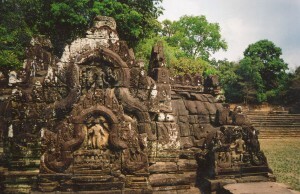 Claude Jacques wrote that Neak Pean was originally a royal Hindu temple, and that the central shrine had a door on each side. 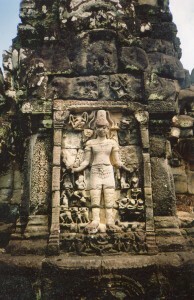 Three sides were walled up and given a Lokesvara statue after Jayavarman converted. 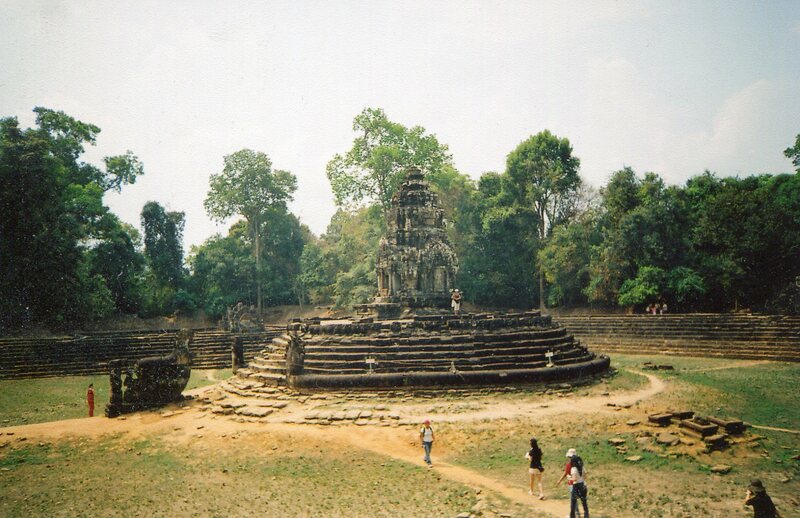 So perhaps Jayavarman converted Neak Pean into a place to bestow the Buddha’s compassion on his people. But whether he did or not, the dainty chapels and shrine, the sparkling water in the ponds, and the surrounding greenery made this an enchanting place, which is well worth lingering over.